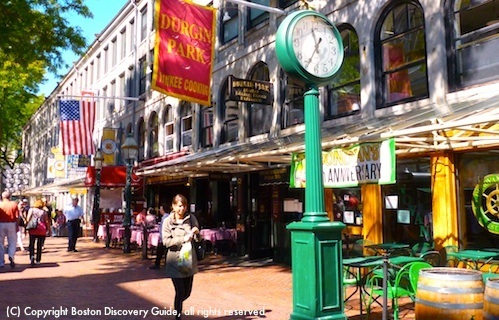 Durgin Park, one of the oldest Boston restaurants, satisfies hoards of hungry locals and tourists with generous servings of delicious traditional New England cuisine - just as it has for almost 200 years. As a long-time favorite restaurant in Faneuil Hall Marketplace, Durgin Park satisfies 21st century tastes with fresh fish and shellfish as well as juicy prime rib, huge steaks, and chops. But unlike other Boston seafood restaurants and steakhouses, it also serves specialties such as Yankee Pot Roast and New England Corned Beef and Cabbage that you no longer see in most other Boston restaurants. And this New England comfort food is just the beginning of the reasons to dine here. Durgin Park's 3 dining rooms are located on the second floor of a former warehouse, part of the popular Faneuil Hall Marketplace. During warm weather, attractive outdoor dining provides an additional option. The landmark restaurant has occupied this spot ever since John Durgin and Eldridge Park bought it back in 1827. 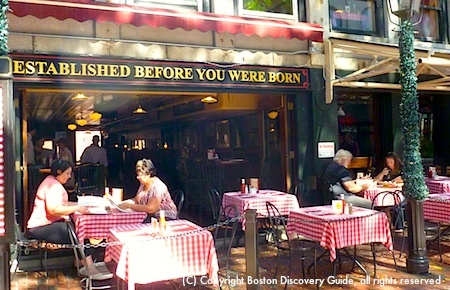 Outside Durgin Park, you'll see a sign that says, "Established before you were born." When you walk in, you'll get the sense that not too much has changed since it first opened. From the stamped tin ceilings to the uneven wooden floors to the long communal tables covered with red and white checkered tablecloths, everything that you see promises an experience from "old school Boston." Waitresses wear rather unattractive white uniforms. Most of the waitstaff speak with a pronounced Boston accent. At one point in the 1950s, the restaurant deliberately began to emphasize bad service and rude waitresses as part of the old-time ambiance. Boston tourist guidebooks invariably mention this but don't be put off - we've never experienced anything other than great service during many visits through the years, and would guess that the tradition is long gone. In addition to Yankee comfort food, you'll find lots of fresh seafood. Choose from a nice assortment of oysters and several types of local clams - enjoy them raw or steamed. Other good best include mussels, oyster stew, clam chowder (New England style, of course), and fish chowder. And of course, you'll find lots of lobster choices. If you want to try a whole lobster (check out our directions for how to eat lobster if you're not sure), you can choose between having it steamed live or stuffed and baked. But you'll also find other traditional preparations, such as fresh fried lobster and lobster sauteed with wine and butter. Other local dishes include fresh Boston schrod and the New England Clambake - clam chowder, lobster, steamers, boiled potato, and corn on the cob. However, lots of local Bostonians invariably mention the prime rib as a favorite. Huge servings literally hang off the side of your plate - part of the attraction for prime rib fans. For true local flavor, don't miss the Boston baked beans, slowly cooked the old fashioned way in stone crocks. Try them and you'll see why they're considered the best in Boston. Should You Order the Indian Pudding? If you want to try traditional desserts, Durgin Park's Indian Pudding is a popular selection. If you've never had this, it's basically cornmeal and molasses simmered together for a long time and served with vanilla ice cream - in my opinion, it's an acquired taste. Personally, I recommend the Strawberry Shortcake or the Boston Cream Pie - my idea of New England cuisine at its finest. Why Dine at Durgin Park? Perhaps because of the restaurant's Faneuil Marketplace location, some people think that it's just a tourist attraction - or even worse, a tourist trap. True, this historic downtown restaurant is popular with tourists, and for good reason - it's been here for almost 200 years, and serves traditional Yankee favorites. But plenty of locals love it too. The home-style cooking and old favorites are delicious, plus the casual atmosphere makes it a perfect spot for large groups. It's a remnant of old Boston, similar to the slightly older Union Oyster House, more seafood-oriented restaurant, just a few blocks away. Bottom line? If you like the type of food that Durgin Park serves or want to try traditional dishes that you might not find elsewhere or are just looking for a good restaurant near Quincy Market, come for the food. Otherwise, come for the experience.